Seminole Dining is ranked among the best food service providers for colleges and universities in the country. The article can be found here: https://bit.ly/2AIMHxn. Seminole Dining has adopted three farms — Full Moon Apiary (honey) in Monticello, Fla., West Coast Mushrooms in Quincy, Fla., and New North Florida Cooperative (collards) in Marianna, Fla.
Students have access to more than 20 on-campus retail locations and three dining halls. 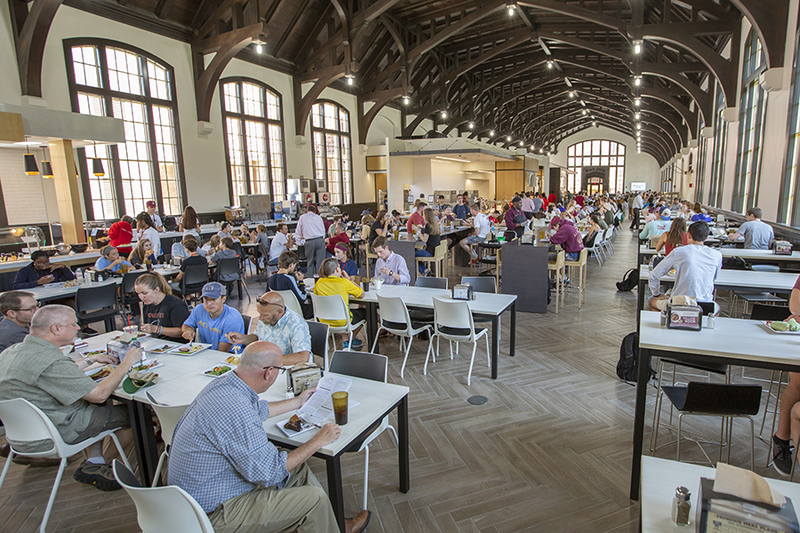 The Suwannee Room — Seminole Dining’s largest residence dining hall — reopened in July 2018 with an $8.4 million makeover “that resulted in an open-kitchen layout so that students can see just what is going into their food.” The Suwannee Room also houses My Zone, an enclosed pantry for students with special dietary needs. Seminole Dining also proudly boasts 1851, four micro-restaurants and a convenience store attached to Azalea Hall, and numerous retail operations, including Subway and Steak ’n Shake, which recently opened in the first floor of the Woodward Garage. Seminole Dining is operated by Sodexo, a global leader in delivering facilities management and food service operations around the world. Florida State partnered with Sodexo in early 2017 with a shared goal of elevating the dining experience on campus for students and visitors alike. Sodexo Universities East CEO Jim Jenkins echoed that sentiment. Seminole Dining Regional District Manager John Teeple said the goal is to ensure Florida State University students, faculty and staff have high-quality food and beverages with excellent customer service and for an affordable price.